Feasting in a field is one gourmet experience everyone should do at least once. Experience No.089 in Australian Traveller Magazine’s 100 Greatest Australian Gourmet Experiences. Feasting in a field is one gourmet experience everyone should do at least once. If the scene in your head is filled with flies and billycans, you’re in the wrong field. Chef Joe Cross prepares a modern Australian menu with native elements, so don’t be surprised to see Peppered Eyre Peninsula Kangaroo Fillet or Spear Creek Dorper Lamb dishes. On a Walking Safari through Arkaba Station on the southern edge of SA’s Flinders Ranges, gas lanterns surround a table set for two beneath a sky so clear a bug wouldn’t dare wander by. We’re sure the hosts would personally swat away any wayward pests, in fact they’d do just about anything to ensure this is a night to remember. On a Walking Safari through Arkaba Station on the southern edge of SA’s Flinders Ranges, gas lanterns surround a table set for two beneath a sky so clear a bug wouldn’t dare wander by. Sitting on 6000 acres of wilderness, the Arkaba Station Homestead dates back to 1851. Today, meals take place on the terrace. Chef Joe Cross prepares a modern Australian menu with native elements, so don’t be surprised to see Peppered Eyre Peninsula Kangaroo Fillet or Spear Creek Dorper Lamb dishes. The kitchen uses Gilbert’s SA Southern Flinders Blue Gum Honey and Murray River Pink Salt to flavour the food. Guided 4WD trips, wildlife safaris, hiking, mountain biking and joy flights over the saltpans are just some of the ways to stay entertained. 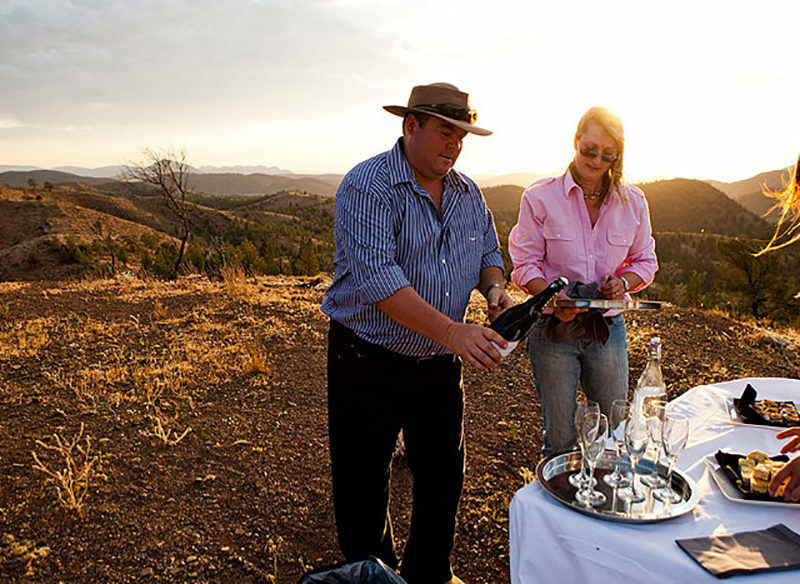 With Wilpena Pound on the northern edge of the property, there’s plenty to see before dinnertime. Sitting on 6000 acres of wilderness, the Arkaba Station Homestead dates back to 1851. Arkaba is a working sheep station, so head over in August for shearing season.